Stick to a budget, learn German, and get a handle on your photo library with today’s collection of apps. Toast Moments: eCard Manager ($0.99 → Free, 59.4 MB): Celebrate special moments with Toast. Social butterflies. Toast provides an innovative way to celebrate milestones of all kinds, from birthdays and holidays to graduations and promotions. Customize your toast with a theme and an image that matches the reason for celebration. Then decide who in your group should be involved in the toast and when you’d like to raise it. This allows everyone in the group to join in on the activity no matter where they’re located. Toast even acts as a personal diary, allowing you to look back over your timeline. Toast Moments: eCard Manager is available for free for a limited time. It has a 5-star rating with a total of 63 ratings. Budgets Pro – Expense Tracker ($2.99 → Free, 8.4 MB): Create budgets and stick to them with Budgets. Anyone who struggles with their finances. Budgets helps ensure that you live within your means. Start off by creating your budget within the “Set Up” menu. You’re able to add categories like gas, groceries, clothes, and rent along with how much you’re allowed to spend on them. Then every time you make a purchase or payment, log it by entering an amount, categorizing it, attaching a description, and adding a date paid. Budgets’ main screen allows you to easily check how much you have left to spend via a coin tube graphic. The app also allows you to carry over unused budget amounts, view purchase history, create reports, and passcode protect your data. Budgets Pro – Expense Tracker is available for free for a limited time. It has a 5-star rating with a total of 9 ratings. Learn German – MosaLingua ($4.99 → Free, 45.1 MB): Learn German in no time with this language app. Everyone from students to frequent travelers. MosaLingua will help you memorize thousands of German vocabulary words, key phrases, and conjugations in no time. All it takes is five minutes each day for two months and you will have memorized 600 words and key phrases. Nothing to it, right? The app utilizes a flashcard system with audio pronunciations by native German speakers. MosaLingua includes more than 3,000 flash cards, 14 categories, more than 100 subcategories, and the ability to unlock fun bonus content. 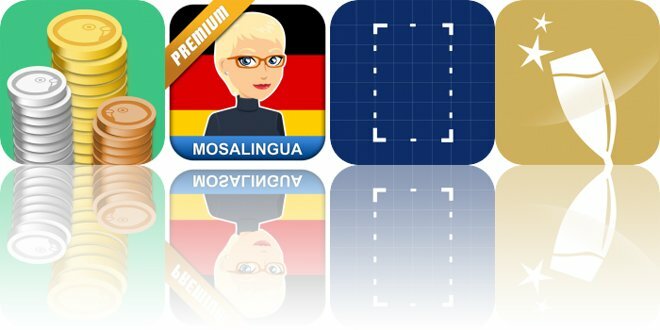 Learn German – MosaLingua is available for free for a limited time. It has a 4.5-star rating with a total of 39 ratings. Screenshots – Find, Share, and Delete Screenshots ($0.99 → Free, 14.2 MB): Get a handle on your photo library with Screenshots. Those who are constantly taking screenshots. Screenshots helps you easily find, hide, share, and even delete the screenshots cluttering up your library. It features a wide variety of filtering options, allowing you to hunt down screenshots by date, device type, and even orientation. Screenshots – Find, Share, and Delete Screenshots is available for free for a limited time. It has a 4.5-star rating with a total of 63 ratings.